One of the coolest trends to come about in the digital, computer-driven age of office products is the ability to personalize your media. No longer content with just writing “Presentations” or “Office Jams ‘09” on our discs with a Sharpie, true connoisseurs of personalized media now have a wealth of options to choose from. Let’s take a look at the various levels available. The most cost-friendly and accessible level of labeling discs, the printable label comes in a variety of formats. These labels come in a pack like standard printer paper, and are available in glossy, matte or even clear varieties. Simply choose a brand of label, download the free template for use in your graphics editor of choice, and choose your design. Since you’re printing directly on a self-adhesive label just as you would print any other document, the sky is the limit in terms of color and design. as templates for Photoshop and other image programs. As far as application goes, if you feel you don’t have a steady enough hand to line up the label yourself, there’s a really cool product called the Stomper: just lay your label down sticky-side up, put a disc upside-down on the top peg, and press down. Presto! Perfectly applied labels every time. I have one of these and I have to say when I got it I had what could be described as a potentially inappropriate amount of fun labeling every homemade disc I own. The only real downside to printable labels is permanence; if the disc is handled frequently or will need to be accessed for a long period of time, there’s the chance that the label will start to curl or peel up off the disc. Since the cost is so low per label, though, it’s easy to just print off a replacement for a frequently-used disc. 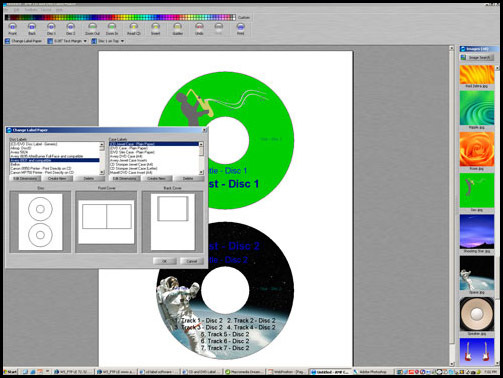 Taking the idea of a printable label one step further, it is also possible to buy special discs which have been prepared specifically to be printed on. Since you are printing directly onto the disc itself, there’s no worry of the label peeling off, and you still get the same range of color and design choices. 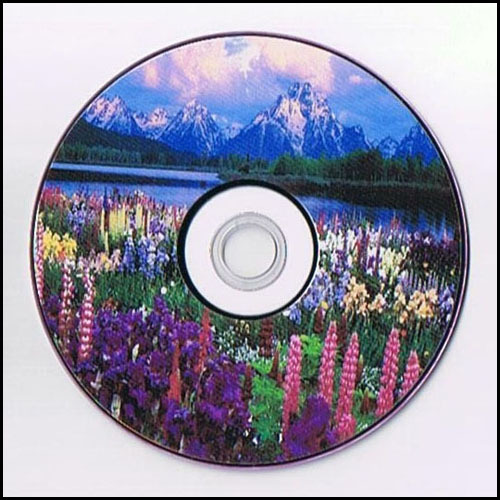 Since there’s no flexibility in the disc, you may notice some “pass lines” from your printer; color gradients and edges can get a little fuzzy, so simple designs are usually the best. Quality is not photo-perfect but definitely impressive. The downside to printing directly onto a disc is the fact that you need a printer capable of doing it, but any modern office printer worth its salt should have this option, so you’re probably not in any trouble there. If it turns out your home or office budget doesn’t allow for purchasing special hardware, there’s always the perfectly acceptable option of printing your own labels as described above. Speaking of special hardware, one of the coolest innovations I’ve seen in a while is Lightscribe. Here, instead of using a standalone printer to print with ink on a disc, the Lightscribe drive uses the same laser to burn both your media and your design onto a specially-prepared disc. After the disc is finished burning, you take it out, flip it over, and put it back in the drive to have the top etched with whatever design you want. Special chemicals on the disc are darkened by the laser, providing a near-permanent design without using any of your precious printer ink. I don’t know what kind of office would print a disc like this, but I want to work there. The downside to Lightscribe is that the designs are monochromatic, since you are not using ink. The process is similar to woodburning or any other etching; you end up with a light grey design on a solid color background (usually gold, though silver and other color options are sometimes available). 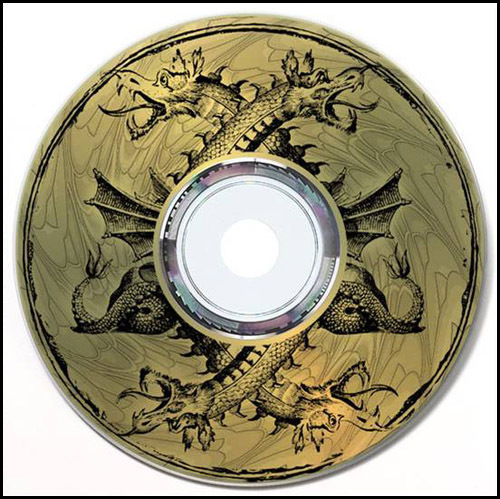 The cool thing is that Lightscribe drives work with the special discs to map your design’s location, so you can give multiple passes to darken the disc or even add on to the design later without worrying that it will come out crooked. So there you have it! A couple of simple options to help you customize one of the most commonly used items in any office: the humble burned disc. In an age where data is increasingly passed around via USB stick or memory card, it’s possible that the burned CD or DVD is on its way out the door (which makes me feel old; remember when we were saying that about floppy disks? ), but in the meantime, don’t be afraid to dress up your discs before handing them out. It will add an air of fun or professionalism to an otherwise blank canvas. If you have any particularly stand-out examples of custom labeling, email them to me at chase@ontimesupplies.com and I’ll be sure to showcase them here.